For thousands of Coast Guard members who responded to the 2010 BP Deepwater Horizon disaster, the dangers were clear — an oil platform in flames and then a hole in the seafloor spewing millions of gallons of oil. But what made many Coast Guard members truly afraid was what came after. “I can tell you Coast Guard members were terrified of the concept of dispersants,” said Rear Admiral Erica Schwartz, the Coast Guard’s director of health and safety. 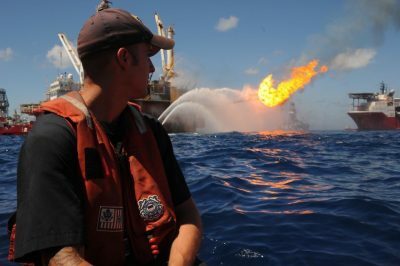 The nearly 2,000 Coast Guard members who reported exposure to oil dispersants suffered a range of illnesses — lung irritation, skin rash, nausea, vomiting and diarrhea — at higher rates than members who were not exposed to the chemicals or were exposed to oil alone, according to research by the Uniformed Services University, a Maryland health sciences and medical school run by the federal government. “With increased levels of exposure there was a higher prevalence of reporting cough and shortness of breath, and more reporting of wheeze than non-exposed people,” said Jennifer Rusiecki, a USU researcher involved in two recent studies on the health of Coast Guard personnel who responded to the disaster.